Location Intelligence is a powerful, unique feature of Pronology’s flagship CenterPoint MAM system that enables editors, producers and other users to quickly determine whether required content is available immediately on site or needs to be transferred from another site anywhere in the world. Giving users “at-a-glance” access to content in every format, including 4K, the feature was designed to erase the barriers of distance and add greater efficiency to tapeless production and post workflows. Location Intelligence is now available to all existing CenterPoint system customers. Many productions acquire and store their high-resolution footage — and often multiple copies of that footage — in locations separate from where producers and editors need to work with it. Assets can be spread across storage pools in the same building, in an OB van across town or at a facility across the globe. CenterPoint’s Location Intelligence helps users streamline the process of finding and delivering the right resolutions to the right people for maximum efficiency. No more wasting valuable time, bandwidth and storage space transferring redundant media or creating extraneous copies of assets that already exist. With Location Intelligence, editors can simply glance at an icon to pinpoint a media asset’s location. If the high-resolution material is not available within a current storage pool, an editor can then request a copy be delivered to his or her location. Location Intelligence always determines the best source to use for the request. If the media already exists in the proper location, it will be used in place; if it does not exist, it will automatically be transferred from the most convenient location, either as a full asset or as a partially extracted sub-clip. 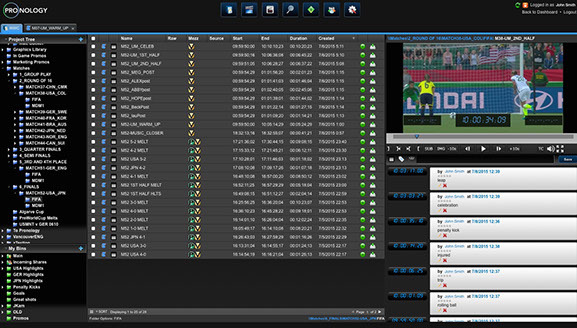 Robust, user-tested technology: The Location Intelligence feature was initially deployed by FOX Sports for its month-long coverage of the FIFA Women’s World Cup Canada 2015 and managed multiple locations between the events, broadcast facilities in Canada and edit facilities located in the United States.